Tens of thousands of civilians killed. Several hundred thousand Kazakh and Kyrgyz people killed or evicted. Unknown number killed by starvation. The Basmachi movement (Russian: Басмачество, Basmachestvo) officially called the Turkestan Liberation Organization was group which undertook a protracted uprising against Russian Imperial and Soviet rule by the Muslim peoples of Central Asia. The movement's roots lay in the anti-conscription violence of 1916 that erupted when the Russian Empire began to draft Muslims for army service during World War I. In the months following the October 1917 Revolution the Bolsheviks seized power in many parts of the Russian Empire and the Russian Civil War began. Turkestani Muslim political movements attempted to form an autonomous government in the city of Kokand, in the Fergana Valley. The Bolsheviks launched an assault on Kokand in February 1918 and carried out a general massacre of up to 25,000 people. The massacre rallied support to the Basmachi movements who waged a guerrilla and conventional war that seized control of large parts of the Fergana Valley and much of Turkestan. The fortunes of the decentralized movement fluctuated throughout the early 1920s but by 1923 the Red Army's extensive campaigns had dealt the Basmachis many defeats. After major Red Army campaigns and concessions regarding economic and Islamic practices in the mid-1920s, the military fortunes and popular support of the Basmachi declined. Resistance to Russian rule and Soviet leadership did flare up again, to a lesser extent, in response to collectivization campaigns in the pre-WWII era. Major violence in Russian Turkestan broke out in 1916, when the Tsarist government ended its exemption of Muslims from military service. This caused the Central Asian revolt of 1916, centered in modern-day Kazakhstan and Uzbekistan, which was put down by martial law. Tensions between Central Asians (especially Kazakhs) and Russian settlers led to large-scale massacres on both sides. Thousands died, and hundreds of thousands fled, most into the neighbouring Republic of China. The Central Asian revolt of 1916 was the first anti-Russian incident on a mass scale in Central Asia, and it set the stage for native resistance after the fall of Tsar Nicholas II in the following year. The suppression of the rebellion was a deliberate campaign of annihilation against the Kazakh and Kyrgyz tribes on the part of the Russian soldiers and settlers. Hundreds of thousands of Kazakh and Kyrgyz people were killed or expelled. The ethnic cleansing had its roots in the Tsarist government policy of ethnic homogenization. The Tashkent Soviet initially recognized the authority of Kokand, but restricted its jurisdiction to the Muslim old section of Tashkent, and demanded the final say in regional affairs. After violent riots in Tashkent, relations broke down, and despite the leftist leanings of many of its members, Kokand aligned itself with the Whites. Politically and militarily weak, the Muslim government began looking around for protection. To this end, a band of armed robbers led by Irgash Bey were amnestied and recruited to defend Kokand.[when?] This force, however, was unable to resist an attack on Kokand by the forces of the Tashkent Soviet. In February, 1918 the Red Army soldiers and Armenian Dashnaks thoroughly pillaged Kokand, and carried out what was described as a "pogrom," in which as many as 25,000 people died. This massacre, along with the execution of many Ferghana peasants who were suspected of hoarding cotton and food, incensed the Muslim population. Irgash Bey took up arms against the Soviets, declaring himself "Supreme Leader of the Islamic Army", and the Basmachi rebellion started in earnest. With the Tashkent Soviet in a vulnerable military position, the Bolsheviks left Russian settlers to organize their own defense by creating the Peasant Army of Fergana. This often involved brutal reprisals for Basmachi attacks by Soviet forces and Russian farmers both. The harsh policies of War Communism, however, caused the peasants' army to sour on the Tashkent Soviet. In May 1919, Madamin Bey formed an alliance with the settlers, entailing a non-aggression pact and a coalition army. The new allies made plans for establishing a joint Russian-Muslim state, with power sharing arrangements and cultural rights for both groups. Disputes over the Islamic orientation of the Basmachi led to the break-up of the alliance, however, and both Madamin and the settlers suffered defeats at the hands of the Muslim Volga Tatar Red Brigade. The inhabitants of the Ferghana Valley were exhausted after the punishing winter of 1919-20, and Madamin Bey defected to the Soviet side in March. Meanwhile, famine relief reached the region under the more liberal New Economic Policy, while land reform and amnesty placated Ferghana residents. As a result, the Basmachi movement lost control of most populated areas and shrank overall. In November 1921, General İsmail Enver, former Turkish war minister and one of the architects of the Armenian genocide (along with other two members of the "Three Pashas" triumvirate - Talaat Pasha and Djemal Pasha), arrived in Bukhara to assist the Soviet war effort. Instead of doing so, he defected and became the single most important Basmachi leader, centralizing and revitalizing the movement. Enver Pasha intended to create a pan-Turkic confederation encompassing all of Central Asia, as well as Anatolia and Chinese lands. His call for jihad attracted much support, and he managed to transform the Basmachi guerillas into an army of 16,000 men. By early 1922, a considerable part of the Bukharan People's Soviet Republic, including Samarkand and Dushanbe, was under Basmachi control. Meanwhile, Dungan Muslim Magaza Masanchi formed the Dungan Cavalry Regiment to fight for the Soviets against the Basmachi. Although many fighters were motivated by calls for jihad, the Basmachi drew support from many ideological camps and major sectors of the population. At some point or another[vague][when?] the Basmachi attracted the support of Jadid reformers, pan-Turkic ideologues and leftist Turkestani nationalists. Peasants and nomads, long opposed to Russian colonial rule, reacted with hostility to anti-Islamic policies and Soviet requisitioning of food and livestock. The fact that Bolshevism in Turkestan was dominated by Russian colonists in Tashkent made Tsarist and Soviet rule appear identical. The ranks of the Basmachi were filled with those left jobless by poor economic conditions, and those who felt that they were opposing an attack on their way of life. The first Basmachi fighters were bandits, as their name suggests, and they reverted to brigandage as the movement fizzled later on. Although the Basmachi were relatively united at certain points, the movement suffered from atomization overall. 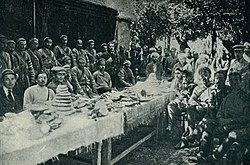 Rivalry between various leaders and more serious ethnic disputes between Kyrgyz and Uzbeks or Turkmen posed major problems to the movement. After the Basmachi movement was destroyed as a political and military force, the fighters that remained hidden in mountainous areas conducted a guerrilla war. The Basmachi uprising had died out in most parts of Central Asia by 1926. However, skirmishes and occasional fighting along the border with Afghanistan continued until the early 1930s. Junaid Khan threatened Khiva in 1926, but was finally exiled in 1928. Two prominent commanders, Faizal Maksum and Ibrahim Bey, continued to operate out of Afghanistan and conducted a number of raids into the Tajik Soviet Socialist Republic in 1929. Ibrahim Bek led a brief resurgence of the movement when collectivization fueled resistance and succeeded in delaying the policy until 1931 in Turkmenistan, but he was soon caught and executed. The movement then largely died out. In Kyrgyzstan, the last strongholds of the Basmachi were destroyed by 1934. The rebellion featured in several "Red Westerns", such as White Sun of the Desert, The Seventh Bullet and The Bodyguard, in the television series State Border. ^ In Union with him and Bey Madamin counter-revolutionary robber bands with July 10, 1919, to January 1920. ^ Muḥammad, Fayz̤; Hazārah, Fayz̤ Muḥammad Kātib (1999). Kabul Under Siege: Fayz Muhammad's Account of the 1929 Uprising. Markus Wiener Publishers. p. 12. ISBN 9781558761551. ^ Soviet Disunion: A History of the Nationalities Problem in the USSR, By Bohdan Nahaylo,Victor Swoboda, p. 40, 1990. ^ Krivosheev, Grigori (Ed. ), Soviet Casualties and Combat Losses in the Twentieth Century, p. 43, London: Greenhill Books, 1997. ^ a b c Uzbekistan, By Thomas R McCray, Charles F Gritzner, pg. 30, 2004, ISBN 1438105517. ^ a b c d Martha B. Olcott, The Basmachi or Freemen's Revolt in Turkestan, 1918-24, 355. ^ Baberowski and Anselm Doering-Manteuffel 2009, p. 202. ^ Victor Spolnikov, "Impact of Afghanistan's War on the Former Soviet Republics of Central Asia," in Hafeez Malik, ed, Central Asia: Its Strategic Importance and Future Prospects (New York: St. Martin's Press, 1994), 101. ^ Michael Rywkin, Moscow's Muslim Challenge: Soviet Central Asia (Armonk: M. E. Sharpe, Inc, 1990), 41. ^ Martha B. Olcott, "The Basmachi or Freemen's Revolt in Turkestan, 1918-24," Soviet Studies, Vol. 33, No. 3 (Jul., 1981), 361. ^ Richard Lorenz, Economic Bases of the Basmachi Movement in the Ferghana Valley, in "Muslim Communities Reemerge: Historical Perspectives on Nationality, Politics, and Opposition in the Former Soviet Union and Yugoslavia", Editors: Andreas Kappeler, Gerhard Simon, Gerog Brunner, 1994, pg. 280. ^ Richard Lorenz, Economic Bases of the Basmachi Movement in the Ferghana Valley, in "Muslim Communities Reemerge: Historical Perspectives on Nationality, Politics, and Opposition in the Former Soviet Union and Yugoslavia", Editors: Andreas Kappeler, Gerhard Simon, Gerog Brunner, 1994, pg. 282. ^ Richard Lorenz, Economic Bases of the Basmachi Movement in the Ferghana Valley, in "Muslim Communities Reemerge: Historical Perspectives on Nationality, Politics, and Opposition in the Former Soviet Union and Yugoslavia", Editors: Andreas Kappeler, Gerhard Simon, Gerog Brunner, 1994, pg. 284. ^ Hafeez Malik, Central Asia, p.101. ^ Baberowski and Anselm Doering-Manteuffel 2009, pp. 201-202. ^ Richard Lorenz, Economic Bases of the Basmachi Movement in the Ferghana Valley, 186. ^ Richard Lorenz, Economic Bases of the Basmachi Movement in the Ferghana Valley, 290. ^ Martha B. Olcott, The Basmachi or Freemen's Revolt in Turkestan, 1918-24, 354. ^ Michael Rywkin, Moscow's Muslim Challenge, 22. ^ Richard Lorenz, Economic Bases of the Basmachi Movement in the Ferghana Valley, 291. ^ a b Richard Lorenz, Economic Bases of the Basmachi Movement in the Ferghana Valley, 293. ^ Richard Lorenz, Economic Bases of the Basmachi Movement in the Ferghana Valley, 32. ^ Michael Rywkin, Moscow's Muslim Challenge, 24. ^ Richard Lorenz, Economic Bases of the Basmachi Movement in the Ferghana Valley, 295. ^ Martha B. Olcott, The Basmachi or Freemen's Revolt in Turkestan, 1918-24, 356. ^ Michael Rywkin, Moscow's Muslim Challenge, 34. ^ Richard Lorenz, Economic Bases of the Basmachi Movement in the Ferghana Valley, 296. ^ Michael Rywkin, Moscow's Muslim Challenge, 35. ^ Fazal-Ur-Rahim Khan Marwat, The Basmachi Movement in Soviet Central Asia, 160. ^ Michael Rywkin, Moscow's Muslim Challenge, 36. ^ a b c Martha B. Olcott, The Basmachi or Freemen's Revolt in Turkestan, 1918-24, 358. ^ Joseph L. Wieczynski (1994). The Modern encyclopedia of Russian and Soviet history, Volume 21. Academic International Press. p. 125. ISBN 0-87569-064-5. Retrieved 2011-01-01. ^ Martha B. Olcott, The Basmachi or Freemen's Revolt in Turkestan, 1918-24, 357. ^ a b c d Michael Rywkin, Moscow's Muslim Challenge, 42. ^ Moscow's Muslim Challenge: Soviet Central Asia, Michael Rywkin, page 43. ^ Richard Lorenz, "Economic Bases of the Basmachi Movement in the Ferghana Valley," in Andreas Kappelerm Gerhard Simon, Edward Allworth, ed, Muslim Communities Reemerge: Historical Perspectives on Nationality, Politics, and Opposition in the Former Soviet Union and Yugoslavia (Durham: Duke University Press, 1994), 277. ^ Martha B. Olcott, "The Basmachi or Freemen's Revolt in Turkestan, 1918-24," Soviet Studies, Vol. 33, No. 3 (Jul., 1981), 252. ^ Richard Lorenz, Economic Bases of the Basmachi Movement in the Ferghana Valley, 289. ^ Fazal-Ur-Rahim Khan Marwat, The Basmachi Movement in Soviet Central Asia (A Study in Political Development) (Peshawar, Emjay Books International: 1985), 151. ^ Ritter, William S (1990). "Revolt in the Mountains: Fuzail Maksum and the Occupation of Garm, Spring 1929". Journal of Contemporary History 25: 547. doi:10.1177/002200949002500408. ^ Ritter, William S (1985). "The Final Phase in the Liquidation of Anti-Soviet Resistance in Tadzhikistan: Ibrahim Bek and the Basmachi, 1924-31". Soviet Studies 37 (4). Baberowski, Jörg; Doering-Manteuffel, Anselm (2009). Geyer, Michael; Fitzpatrick, Sheila (eds.). Beyond Totalitarianism: Stalinism and Nazism compared. Cambridge University Press. ISBN 978-0-521-89796-9. Joseph Castagné. Les Basmatchis: le mouvement national des indigènes d'Asie Centrale depuis la Révolution d'octobre 1917 jusqu'en octobre 1924. Paris: Éditions E. Leroux, 1925. M. Holdsworth: "Soviet Central Asia, 1917–1940", Soviet Studies, Vol. 3 (1952), No. 3, pp. 258–277. Hasan B. Paksoy, "BASMACHI": Turkish National Liberation Movement 1916–1930s, Modern Encyclopedia of Religions in Russia and the Soviet Union (FL: Academic International Press) 1991, Vol. 4, pp. 5–20.